Polymorphism of the S-locus glycoprotein (SLG) and S-locus receptor kinase (SRK) genes in Raphanus sativus was analyzed by PCR-RFLP using SLG- and SRK-specific primers. Twenty four inbred lines of R. sativus could be grouped into nine S haplotypes. DNA fragments of SLG alleles specifically amplified from five S haplotypes by PCR with Class-I SLG-specific primers showed different profiles upon polyacrylamide-gel electrophoresis after digestion with restriction endonucleases. The five R. sativus SLG alleles were determined for their nucleotide sequences of DNA fragments. Comparison of the amino-acid sequences with a reported Brassica SLG (S6) showed 77–84% homology. Deduced amino-acid sequences showed 12-conserved cystein residues and three hypervariable regions which are characteristic of Brassicsa SLG. A DNA fragment was also amplified by PCR from two of each S haplotype with Class-II SLG-specific primers, and showed polymorphism when cleaved with restriction endonucleases. The nucleotide sequences of amplified DNA fragments of the Class-II SLG revealed about 60% similarity with those of the Class-I SLG. It is concluded that there exist both Class I and Class II S alleles in R. sativus, as in Brassica campestris and Brassica oleracea. PCR using SRK-specific primers amplified a DNA fragment of about 1.0 kb from seven of each S haplotype out of 24 tested. These DNA fragments showed high polymorphism in polyacrylamide-gel electrophoresis after digestion with restriction endonucleases. Nucleotide sequences of the DNA fragments amplified from the seven S haplotypes showed that the fourth and the fifth exons of SRK are highly conserved, and that there is high variation in the fifth intron, the sixth intron and seventh exon of the SRK which may be responsible for the polymorphic band patterns in PCR-RFLP analysis. The PCR-RFLP method has proven useful for the identification of S alleles in inbred lines and for listing S haplotypes in R. sativus. Phylogenic analysis of the SLG and SRK sequences from Raphanus and Brassica revealed that the Raphanus SLGs and SRKs did not form an independent cluster, but were dispersed in the tree, clustering together with Brassica SLGs and SRKs. Furthermore, SLGs and SRKs from Raphanus were both grouped into Class-I or Class-II S haplotypes. 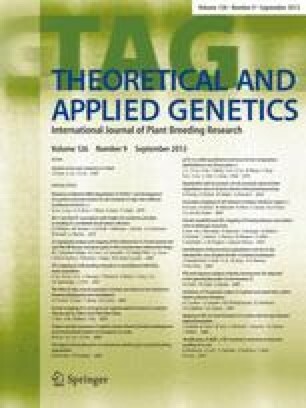 Therefore, these results suggest that the diversification of the SLG and SRK alleles occurred prior to the differentiation of the two genera Brassica and Raphanus.